The latest developments in aluminium recycling using tilting rotary furnaces (TRF ) taking as reference a new 30 000 TPY secondaries plant in France. 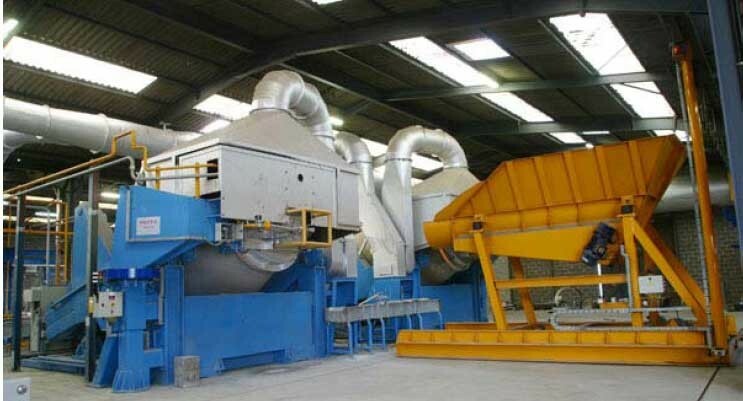 The plant is equipped with two 12 tonne TRF for melting general commercial scrap and a 7.5 tonne TRF primarily used for melting aluminium dross together with two 30 tonne refining/holding furnaces, swarf dyer, casting equipment and automated ingot stacker. The paper also compares the new plant with the owner’s original plant that is equipped with traditional fixed axis rotary furnaces (FARF). The annual production capacity at St Arnoult is at present approximately 15,000 tonnes and each shift operates with 11 people. The plant specialises in gravity and pressure die alloys. It is impossible for a company to remain ‘static’ even in (some would say especially in) the present economical climate and the SNR company took the decision to increase their production volumes considerably to meet a very strong demand from the automotive sector. The company could not grow further on their original site and so after 3 years of research, reflection and equipment comparisons SNR took the decision to locate their second aluminium refinery at Prémery, 250km south of Paris, on a ‘brownfield’ site previously operated by Bostik (the glue manufacturers). SNR have invested 7 million euros in the new plant. During the three years of preliminary study, SNR reviewed the different options and latest melting practices offered by the market: reverberatory furnaces (with and without pumps), dry hearth furnaces and tilting rotary furnaces before opting for the latter solution. Offering low energy consumption and high thermal yields. If we compare the concept of the tilting rotary furnace (TRF) with the traditional fixed axis rotary furnace (FARF) the advantages are evident. The chamber of the FARF is nothing more than a rotating tube or corridor, with in its simplest form, a burner at one end and a flue at the other. The furnace operates under negative pressure and draws in cold ‘parasite air’ from outside the chamber thus making it virtually impossible to control the atmosphere of the furnace which is nearly always oxidizing (air rich). This condition makes it necessary to use large quantities of salt (NaCl/KC) to protect the charge and obtain acceptable metal yields. The charge, as it approaches liquidus, remains more or less static. As with all high temperature furnaces heat transfer is achieved primarily by radiation and re-radiation (via the refractory lining) but not as efficiently as in a TRF. The TRF furnace on the other hand is closed chamber having a single entrance and exit point. The door carries the burner and the flue. The furnace operates under positive pressure and when the burner is firing there is a total absence of parasite air ingress, therefore the furnace can operate in a slightly ‘reducing’ (gas rich) atmosphere which eliminates the necessity to use a protective salt cover. Additionally, as the furnace operates at an angle, the charge is ‘mixed’ with a similar action to that of a concrete mixer. This improves homogeneity and heat transfer resulting in very high thermal efficiency. SNR compared the tilting rotary furnaces offered by several suppliers before opting for those designed and built by Dross Engineering. Maximum use of rotating unions, eliminating the use of flexible hoses. The TRF units built by Dross Engineering have found applications across the range of non-ferrous industries and are used to melt zinc and aluminium and reduce lead, tin and bismuth oxides thus showing the remarkable versatility of this furnace concept. 1000 dm3 corresponds to approx. 2,70 ton of aluminium melt. *Vari-gas: For explanation click here. Full version is available as standard on all furnaces from Dross 160. ** Door Operations: manual or automated (remote radio control) depending on model and option. ***Burner Type: Furnaces are fitted with either package type or industrial type burners depending on model. All furnaces can be gas or oil fired and models from our Dross 200 can be fitted with oxy burners (oxygen is used instead of combustion air). ****Door Diameter: The furnace capacity (volume) varies depending on the door diameter chosen. The layout of the plant in Prémery has logical structure and divides the foundry into ‘activity zones’. Casting/ingot stacking: 1 linear casting machine 6,000kg/h, automated stacker, and a liquid metal transport station for 14 road transport ladles. The melting and charging plant, holding/refining furnaces, casting and ingot stacking equipment, swarf drying etc.. are supplied by Dross Engineering. The Prémery plant has an annual capacity of 30,000 tonnes and employs 7 foundrymen per shift. The plant is equipped with a bag house filter designed by the French subsidiary of the German company: INTENSIV. The company has a long history designing dry process particulate arrestment for the cement industry, foundries and mines etc… The particularity of the INTENSIV bag-house system is their dual stage reverse air cleaning which ensures optimum performance and low compressed air consumption. In the case of the SNR Prémery plant the media used and the reverse air system enable particulate emissions of less than 0.5mg/Nm3 to be achieved. Additionally the swarf drying unit is fitted with and after burner unit and ‘quench tower’ to avoid formation of NOX. Those who have a long experience in the industry can testify to the fact that ‘there is nothing new under the sun’! 20 or more years ago the trend (in France and Europe) for Secondary Smelters was to equip their furnaces (all their furnaces; rotary and dry hearth) with oxy-gas burners. Effectively improved production rates were achieved (the furnaces were hotter and so melted at higher rates) and improved consumption rates were recorded. But at what cost? Equipment and refractory problems and safety issues had for consequence that all installations reverted to air-fuel burners. Why? Combustion control of oxy-fuel burner systems is extremely specialised and, at the time, the systems available lacked the computing power and programme depth for such burner systems, within the specific application of secondary aluminium smelting in the furnaces of the period, to be really successful. Oxy-fuel presents considerable advantages provided the combustion control system is sufficiently well adapted and also operator friendly. Additionally, for the particular project in question, SNR requires that the new plant operates ‘salt-free’ in order for them to have the possibility to commercialise the residual ash. Therefore, it became imperative for them in choosing the combustion system to be sure that the oxy-fuel burners could benefit from the innovative control system developed by Dross Engineering: Vari-Gas. Define and save to memory an ‘atmosphere curve’ in relation with the type of products to be melted. For example: the melt programme for charge of contaminated feed stock could start off ‘oxidizing’ change to ‘slightly reducing’ and finish ‘neutral’. All these operations are programmed using a few keys on the operator interface. The Vari-Gas system is primarily a furnace control tool that, in the hands of an experienced furnaceman , enables exceptional thermal and metal yields to be obtained. As we have already seen, the basic concept of tilting rotary furnaces lends itself to high thermal yields. Heat transfer rates to the charge by radiation (and re-radiation) and conduction are optimised. When these types of furnace are fitted with oxy-fuel burners, reduced N2 concentrations result in stronger gas radiation and there is a considerable increase in the heat available to melt the charge (approximately 50% more in relation to air gas burners at temperatures of 1100˚C with 95% pure oxygen and natural gas). But it is worth noting that higher ‘localised’ flame temperature is not the only way to achieve higher heat transfer rates and thus improved productivity, increased ‘ambient’ temperature has a greater effect. Oxy-gas burners available today give good flame homogeneity and greater uniformity between flame and furnace temperatures. With Air Liquide’s Albatch burner a highly luminous flame is produced that is up to 3 times wider than conventional oxy-gas burners. Fuel and oxygen are introduced into the furnace through separate injectors with the oxygen being injected above the fuel to improve stability, prevent ‘lofting’ and reduce flame peak temperature. Thermal decomposition of the fuel is improved leading to the formation of highly radiant carbon particles. If we were to compare the thermal yield and fuel consumption with a fixed axis rotary furnace fitted with a traditional air-fuel burner, there is in fact ‘no comparison’. The concept of the fixed axis rotary is well known for its mediocre thermal yield and, in addition, the salt bath requires heating before you even begin to melt the charge of metal. Theoretically, the energy required to melt one tonne of aluminium is 310kW at 100% efficiency, i.e. 31Nm3 of natural gas (with a LCV of 10). In a fixed axis rotary with an air-gas burner, thermal efficiency is very poor and energy consumption per tonne melted are in the region of 100Nm3 natural gas (minimum). On the other hand in a TRF with optimised thermal efficiency energy returns of 50-60Nm3 with an air-gas installation and 35-38Nm3 (plus 70 – 75Nm3 oxygen) can be expected. When using the Vari-gas system, if the charge contains organics such as grease, lacquer etc… it is possible to exploit this ‘latent’ energy rather than sending the unconsumed hydrocarbons to the bag-house filter; In such cases we have recorded energy returns of less than 20Nm3 (in some cases as low as 12Nm3) per tonne melted. It is difficult to talk about metal yields for the many different categories of aluminium scrap as there are far too many variables. However for melting a charge of clean new cast we have recorded yields in excess of 97%. The operator of the two site in question, Prémery and St Arnoult, confirms that over the range of scrap recycled through the two plants they have recorded improved yields of several percentage points at the TRF site (Prémery) as opposed to the site operating fixed axis rotaries (St Arnoult) and there is the considerable additionally advantage of ‘salt-free’ operation at Prémery. Fabrication rejects cost money and every foundry puts in place systems designed to reduce them. When dealing with components with ‘cast-in’ cast iron inserts and sleeves, an additional problem has to be overcome: separate out the iron without polluting the aluminium. Even though such rejects represent a small percentage of overall production they exist and are a source of metal to be exploited. Recycling such components internally raises a number of issues that require resolving: choice of technique and installation running costs. This paper presents the different techniques on the market today and examines the reasons for the choice made by a major European automobile company (PSA) who opted for a system based around a tilting ‘converter’ furnace designed and built by Dross Engineering. We present the equipment itself and the results experienced by the PSA foundry division. The Peugeot SA (PSA) high-pressure aluminium foundry is part of the Mulhouse fabrication complex. It is located in the eastern most part of France, in Southern Alsace, on the frontier with Germany and Switzerland. Part of the PSA group (Peugeot – Citroen), the integrated foundry facility employs some 290 people and produces daily 84 tonnes of engine blocks for the group’s 4 cylinder diesel and petrol engines. The components are produced using the ‘cast-in’ insert technique. The foundry consumes 90 tonnes of aluminium per day either melted on site or bought-in in liquid form. The HP foundry is equipped with 8 x 2500t and 5 x 2000t diecasting presses. • The tilting rotary (TRF) or converter furnace. The concept of the TRF or converter furnace is simple: it is in fact, a rotating closed well, combining the advantages of rotary furnaces, reverbs and dry hearths in a single unit. All these combined in the TRF. Before proceeding with the project, PSA carried out melt trials at an existing plant equipped with a Dross 80 converter furnace. The trials were conclusive and the project was given the ‘green light’. Dross engineering size their furnaces according to the ‘useful capacity’ of the furnace i.e the volume of liquid metal contained in the chamber. A Dross 100 furnace = 1m3 (35ft3) useful volume, a Dross 200 = 2m3 (70ft3) etc…PSA designed their recycling plant around a 2m3 (70 ft3) converter furnace, Dross Engineering’s Dross 200 model. The furnace receives its charge via a dedicated charge machine, also supplied by Dross engineering. Liquid metal is transferred to a 35 tonne (77000 lb) bulk holding furnace via transfer ladles. PSA opted for ladle transfer as opposed to launder transfer for reasons of versatility and the ability to transfer metal to any of their other melting furnaces or directly to their machine holding furnaces. The installation is equipped with an efficient ladle preheat station that has enabled PSA to reduce pour temperature and to increase savings. Off-gas from the furnace is extracted via a cyclone and filter baghouse. The equipment was commissioned in 2002 and PSA have carefully monitored the success of the installation. Methods department engineers have collected a wealth of information that confirms the original findings of the trials. - The furnace is operated by one man per shift who is responsible for all the furnace operations including charging, pouring and cleaning. - The furnace is fitted with a cyclone and baghouse filter rated at 16 500 m3/h @ 200°C. The following particulate emissions have been recorded: 0.41 mg/m3. The European standard calls for 40 mg/m3. The TRF or converter furnace is a ‘dedicated melting furnace’, that can melt a wide range of feed stock and is equally at home processing aluminium, zinc, lead, tin etc…Because the furnace operates as a batch melter, metal pollution by trace elements in the charge (free iron for example) is greatly diminished or even eliminated making it an ideal ‘de-ironing’ unit. The rotary action facilitates charge mixing and promotes melt homogeneity, heat transfer and also promotes self-cleaning. The furnace melts 2 to 3 times faster than equivalent rated static furnaces and offers extremely efficient energy returns. The PSA furnace is fitted with a 2000 kW burner set at 1200 kW, during commissioning, returns of less than 400 kW/t (619 Btu/lb) melted were recorded. Furnace movements are remote controlled by radio link providing a safe, operator friendly working environment. The furnace is designed more like a ‘machine tool’ than a furnace. The movements and stresses, even for smaller models, are unforgiving and punish any misalignment. They demand a level of precision during assembly that is normally reserved for machine tools. For the first furnaces of this type built, Dross Engineering chose to power the rotation via a hydraulic motor. The results were satisfactory but not without problems. This initiated design work that resulted in the adoption of an innovative drive system that is both direct and reliable and that guarantees a positive movement in both directions. The system is compact and ensures a smooth start to rotation under charge; it withstands a wide variation of load at temperature and all the aggression of a foundry environment with a minimum amount of maintenance. The mechanism is patented and grants to Dross Engineering’s furnaces a drive system that is unique for this application. Efforts created by the movement under load and at temperature require a furnace structure that is both robust and precise. Dross Engineering uses the finite element method to provide accurate predictions and evaluations of component response when subjected to thermal and structural loads. Particular attention is paid to assembly tolerances and a large number of components are machined. Guide bands, or tyres, traditionally mounted ‘floating’, are welded to the shell and machined insitu to tight tolerances and run on ‘elastic’ rollers assembled to a high level of precision. This ‘elastic roller’ system is also covered by a recent patent. A rotary seal system linking the hygiene hood with the base of the stack promotes efficient extraction and enables combustion products and fume to be ‘captured’ at source and channelled to an independent cyclone and filter unit or to the plant’ filtration system. The drive mechanism guarantees a wide range of rotation speeds, facilitates change of direction and stoppages – these can be programmed in individual ‘recipes’ according to the type of product processed and lead to a major reduction of particulate in the off-gas stream. In itself, the concept of the converter furnace with its enclosed well allows both the furnace atmosphere and furnace pressure to be adjusted to give optimum stoichiometry and to avoid ingress of parasite air, thus promoting reduced energy consumption and minimal metal losses and the possibility of running completely salt free or with greatly reduced quantities of fluxing agents. To achieve good metal yields the normal practice is to adjust the burner to give an atmosphere inside the furnace that is slightly ‘reducing’ (gas rich). This adjustment usually takes place once and for all during furnace commissioning or during a regular service and is carried out by a qualified technician who manually sets the air and gas control valves after analysis of combustion products. However, certain products and feedstocks would benefit from being able to vary the air/gas ratio at different times during the melt cycle to create an atmosphere in the furnace that is either ‘air-rich’ (oxidizing) or ‘gas-rich’ (reducing) to obtain even higher yields, to optimise production or for metallurgical reasons. Such operational flexibility was not available to foundrymen until now. Completely programmable, the ‘Vari-gas’ system splits the melt cycle into segments that can either be air-rich or gas rich depending on the charge and offers foundrymen and refiners alike real operational flexibility. The fixed chassis of Dross Engineering’s converter furnaces is designed to house the control panel and the hydraulic power pack all of which are wired and piped in their fabrication shops. The refractory lining that is either in brick, castable or pre-cast blocks or even a combination of all three, is also carried out in the fabrication shop. Working this way Dross Engineering can ship furnaces that are completely finished (up to the Dross 700 - 7m3 furnace size), tried and tested in house and so limiting intervention and disruption at the customer’s plant. Normally, from delivery, only 10 - 15 days are required to install and commission the furnace, including refractory drying time. It is almost a ‘plug and play’ furnace! For the furnace operator all the movements of the furnace are remote controlled by radio link. Rotation speed and direction, furnace tilt, door opening and charge machine movements are all controlled remotely for operator safety and ease of use. • Highly versatile, melting a wide range of feed stock from furnace dross to ingot and foundry returns with cast-in inserts. Dross Engineering has the vocation to provide foundries worldwide with innovative solutions to their molten metal problems and in addition to their Converter Furnaces offer a range of equipment that includes Dross Presses and holding furnaces and specially developed melting furnaces for aluminium powder production using immersion heater technology.